A native of St. Louis, Mo., Greg Garlich was a five time All-American at the University of Miami and set records for diving excellence that were not surpassed until Greg Louganis came to UM. Garlich came to the Hurricanes after a 2nd place finish in the 1973 Missouri High School Championships, a 17th place finish in the 3-meter diving competition at the US National Championships and a 7th place finish in the platform event at the 1973 US Outdoor Championships. He earned his first All-American honors at UM in the 3-meter springboard, by placing 5th at the NCAA Finals. The next year he earned All-American honors in both the one and three meter events. In his senior year he again earned All-American honors in both events, and the NCAA finals by finishing 4th place in the 1-meter and 2nd in the 3-meter. Also while at UM Garlich won the one and three meter events in the Southern Independent Championships all four years and set UM records in the 3-meter in 1976 and the 1-meter in 1977. 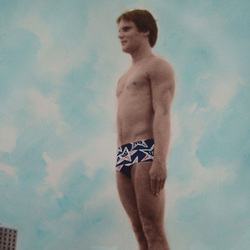 Greg was a member of the US Diving Team from 1976 to 1980. Garlich finished his colligate career at UM and went on to receive his M.B.A. from Washington University in St. Louis.